Shows videos using JW Player software. Hierarchical, collapsible list of videos. Video search using autocompletion matching via AJAX. Tab options to organize videos by modality or locality. Documents and images associated with videos. Multiple keywords for videos for search. Videos can be specific to institution or for all institutions. Administrative facility to manage and upload new videos. Quizzes with multiple choice, text, or checkbox answers are organized by different quiz types. Quiz results can be reviewed by users and administrators. Quiz search using autocompletion matching via AJAX. Question sets allow standalone questions to be organized by keywords. Quiz administration to move quizzes in and out of workshops. Administators can format and edit quizzes with customized visual CKEditor. Quiz schedules by date or rotation for each site. Users can automatically receive alerts when quizzes are activated or scheduled to end. Quiz completion certificates generated in PDF format. Quizzes can contain links to videos, documents, or images. Quizzes can present all questions at once, or one question at a time. Multilevel user system: institution administrator, site administrator, user. 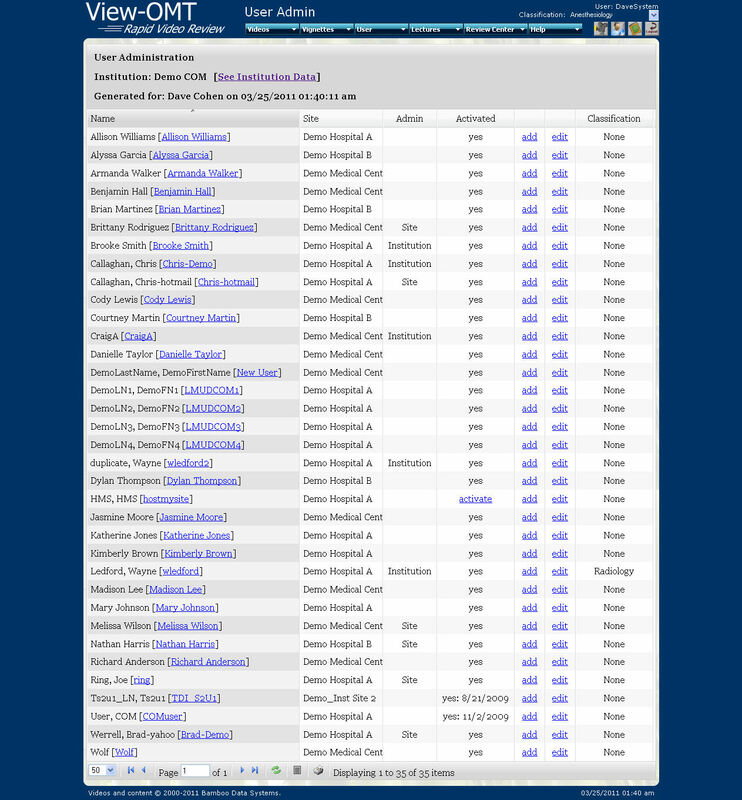 Administrators can manage their institution or site. Automated or manual user registration system. Users can manage their profile. Passwords can be reset, retrieved, or changed. User login integration with existing customer systems. Institution/site logo and color customization. Drill down, AJAX based reports. Administration restricted by access level: system admin, institution admin, site admin. Videos, quizzes, and other resources can be managed for all institutions/sites or specific ones. Reports show cumulative and individual data for items such as quiz scores. Log administration, including video logs. Manual keyword definition or automated initialization based on data. MySQL database, including PHP session data tables. AJAX used to minimize server trips and enhance user experience. Popup windows within other windows for documents and images. Multi-level user management: institution administrators, site administrators, users. Online help can be pulled up by clicking on page title. Pulldown, multi-level menu system customized to integrate with PHP. Videos, images, and documents managed with resource system. Lecture subsystem to present lectures and rate presentations. Automated and manual data backup systems. 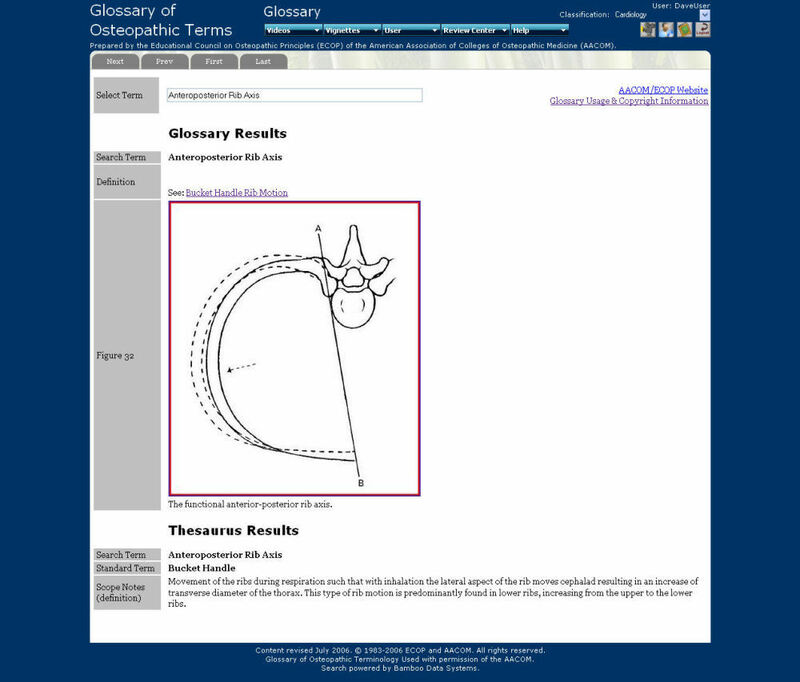 Glossary system using autocompletion system, presents definitions and thesaurus entries.